Join us on Tuesday, June 5 for a social media Day of Action, presented by the PR Council (PRC) and the News Literacy Project (NLP). You may participate as an agency collective and/or as an individual leader by posting your response to this question and including the hashtag, #PartnersInFact. Mock content and images will be provided by the PRC for agency use. All content will drive back to the NLP’s new website, helping to further promote their mission of news literacy. 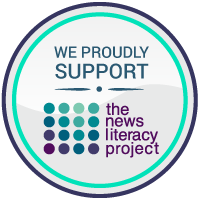 NLP is a nonprofit that works with educators and journalists to teach students how to sort fact from fiction in the digital age. As part of our 20th year anniversary celebration, we have pledged to support the NLP and promote it as best as possible. For more information on the NLP, please visit the Member’s Only section of our website and access the NLP toolkit. You can log in using your LinkedIn account. For more information on how to get involved, please reach out to Eva Chodosh.